Family continuity precedes here. Today, Jean-Pierre Cointreau, in addition President of the National union of the liquor producers, take up his duties within the various entities of family Group and intend to undertake a perennial development of these two companies, Champagne Gosset and Cognac Frapin. For the history, Champagne Gosset, the oldest Wine House in Champagne: Aÿ 1584, was acquired by the family group Renaud-Cointreau (Domaine Frapin, in Cognac) in 1993. Side anecdote, let us stress that the traditional practice of stopping cork and fastening is maintained on certain large bottles, during ageing on slats. 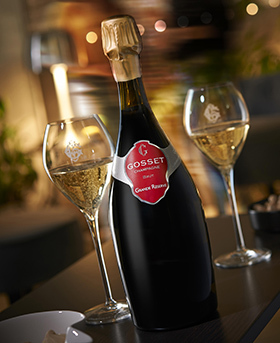 The “Gosset style” is thus specific to an art of living which, for more than four centuries, has been transmitted from generation to generation, combining a solid good sense with the elegance of the heart and spirit. It is a style resulting from an exceptional friable limestone soil supporting the optimal development of the vine and from a know-how to no one another similar. Odilon de Varine, cellar master with the same production line team since years, thus perpetuate the know-how and the Gosset style. Dynamic house, resolutely turned towards the future. The creation, in 1995, of the prestige cuvée Gosset Celebris will have been the highlight of this will to improve the quality dramatically. 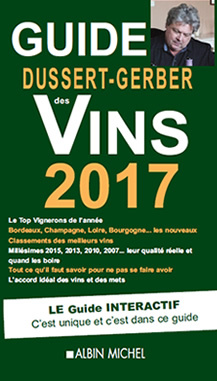 Regarded as one returned with the history and the various generations of the Gosset family and mainly composed of Grand and Premiers crus of Chardonnay of the Côte des Blancs, pinot noir of the Montagne de Reims, and the Grande vallée de la Marne (Aÿ), this cuvée is the floret of the House. Superb range “Celebris”, which reveals the truth of the wine in all its splendor thanks to its extra-brut dosage, the perfect interpretation of the ancestral know-how of the House. You will thus like the Celebris Rosé 2007, with a limpid and luminous pink reflection, very aromatic with notes of wild strawberry, raspberry and wild blackberry, delicately associated to rose and violet, with a fresh and very elegant structure, full and long lasting, a splendid rosé, a gorgeous expression of this beautiful vintage. There is also the Gosset Celebris vintage Extra-Brut 2007, with its minty notes, slightly spicy on the nose. The mouth is long lasting and end on the beautiful bitterness of the Chardonnay with grape-fruit notes.